Piya Mitra is an event planner. 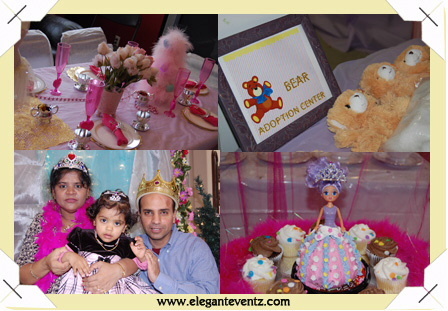 Under the banner of her company “Elegant Eventz” she has organized theme and birthday parties for both kids and adults. If I ask you about your plans for this weekend most of you are going to say you have a birthday party to attend. Most of those parties will either be held at restaurants/banquet halls or crowded children’s birthday party places. Restaurant/Banquet hall/Home – Food is the big factor here. A magic show thrown in for entertainment or a bouncy house. The rest of the time the children just run around the tables & chairs while the parents are busy chatting about work or catching up with each other. At the end of the party the kids get a favor bag full of candy and little toys that are thrown away or lost in a day. Children’s party places (You know the one I am talking about)The kids are very excited about these parties. Most of the children are usually playing in the arcade by themselves, there is no activities as a group, and it’s all extremely impersonal & cookie cutter. At most of these parties you come in hand over the gift, get handed a bunch of coupons for your children, then run around with them playing various arcade games. When it is time to cut the cake the children are gathered together and take 10 minutes eating pizza & cake (while there are three or four more similar cake cutting ceremonies on the next few rows of tables.) As soon as the pizza is polished off, the kids run off to play the arcade games, barely even wishing the birthday child. If you are tired of these two scenarios and would like to try something different here are a few tips. The birthday party is for your child and not your adult friends (consider throwing a separate party to catch up with your friends) so involve your child in planning the party. Say your five year old is into princesses, why not do a princess party? Or a race car or jungle safari for the boys? For teens the possibilities are endless – luau, craft party, fashion design, spa or karaoke party. A theme helps you plan the party better and also is specific to your child’s personality and interests. It is important to set a timetable for your party and activities planned. Print a detailed plan on your evite or invite. i.e. Start planning a birthday party at least three months in advance. Send evites/invites 1 month in advance. Once you have a theme in mind start doing research online for party ideas, there are many sites where moms share party ideas. In my blog I share a lot of party ideas and tips. There are some very good websites that provide complete theme related party packs. You neighborhood party supplies store or dollar store may have many of the things you need. Plan at least two activities to keep the children entertained (one craft and a game etc).You can pick up craft supplies from Michaels, some ideas; design your own t shirts or purses, masks etc. Oriental Trading has many crafts available in dozen packs that are quite inexpensive. I once was invited to four different birthday parties in one day, all of them had food from the same restaurant – the one that specializes in tandoori and all the curries had an ocean of oil floating on top. The heartburn lasted six months!! Kids don’t eat much of the buffet food just a naan or plain rice, so why not consider some creative options. No a chips & dip platter doesn’t work in our community. How about a wrap party? Set out some tortillas, rice, beans, cucumber, chicken/paneer etc, let the guest create their own wraps? A fun and healthier idea for kids is to bake their own pizza. Buy some pizza dough, pizza sauce, cheese and bunch of different toppings and let the children bake their own special pizzas (with adult supervision of course.) Hire a Dosa station. The ideas are endless, be creative. Those of you thinking that this is a lot of work, why not enlist the help of close friends and relatives in set up & clean up ( specially clean up !) You can offer reciprocal services at their parties. You can also hire a children’s party planner if you don’t have the time to plan. It’s actually less expensive than you think, and the party professional will work with you to customize the birthday party to your child's likes and wishes. My website has lots of fun party ideas for children. Try something new and out of the box something that will make your child truly enjoy and remember the party for a long time, after all the party is for them. Soon all your friends will be following the trend set by you! Ps: I just celebrated a "King of our Castle" theme party for my husband’s birthday. Going by the twinkle in his eyes when we crowned him the King of our house, it was a great success. This entry was posted in Parent Talk on August 30, 2008 by vpdot. Top notch ideas here! I vote for this as your ideas can be used for different venues. Awesome article and great ideas. I used this to plan both my son and daughter’s birthday parties. They were a HIT.